"Mother of the True God Who Gives Life"
Just before dawn on December 9, 1531, a poor, 57-year-old widower named Juan Diego was walking through the hills outside Tenochtitlan, Mexico (the Guadalupe area that is near modern Mexico City), on his way to attend church. He began hearing music as he walked closer to the base of Tepeyac Hill, and at first, he thought the beautiful sounds were the morning songs of local birds in the area. But the more Juan listened, the more the music sounded, unlike anything he had ever heard before. Juan started to wonder if he was hearing a heavenly chorus of angels singing. Juan gazed toward the east (the direction from which the music came), but as he did so, the singing faded, and instead, he heard a female voice calling his name several times from atop the hill. So he climbed to the top, where he saw the figure of a smiling girl of about 14 or 15 years old, bathed within a bright golden light. The light shone outward from her body in golden rays that illuminated the cacti, rocks, and grass around her in a variety of beautiful colors. The girl was dressed in an embroidered red and gold Mexican-style gown and a turquoise cloak covered with golden stars. She had Aztec features, just as Juan himself did since he was of Aztec heritage. Rather than standing directly on the ground, the girl stood on a type of platform in the shape of a crescent that an angel held for her above the ground. The girl began speaking to Juan in his native language, Nahuatl. She asked where he was going, and he told her that he had been on his way to church to hear the Gospel of Jesus Christ, whom he had come to love so much that he walked to the church to attend daily Mass whenever he could. Smiling, the girl then told him: "Dear little son, I love you. I want you to know who I am: I am the Virgin Mary, mother of the true God who gives life." She continued: "I would like you to build a church here so that I may give my love, compassion, help, and defense to everyone who seeks it in this place -- for I am your mother, and I want you to have confidence in me and invoke me. In this place, I would like to listen to people’s cries and prayers, and send remedies for their misery, pain, and suffering." Then, Mary asked Juan to go meet with the bishop of Mexico, Don Fray Juan de Zumaraga, to tell the bishop that Saint Mary sent him and desires a church to be built near Tepeyac Hill. Juan fell down to his knees before Mary and vowed to do what she had asked of him. Although Juan had never met the bishop and didn’t know where to find him, he asked around after reaching the city and eventually found the bishop’s office. Bishop Zumaraga finally met with Juan after keeping Juan waiting for a long time. Juan told him what he had seen and heard during the apparition of Mary and asked him to start plans for a church to be built on Tepeyac Hill. But Bishop Zumaraga told Juan he wasn’t ready to consider such a major undertaking. Dejected, Juan began the long journey back home to the countryside, and on the way, he encountered Mary again, standing on the hill where they had met before. He knelt before her and told her what had happened with the bishop. Then he asked her to choose someone else to be her messenger, since he had tried his best and failed to get the church plans started. Mary replied: "Listen, little son. There are many I could send. But you are the one I have chosen for this task. So, tomorrow morning, go back to the bishop and tell him again that the Virgin Mary has sent you to ask him to build a church on this place." Juan agreed to go see Bishop Zumaraga again the next day, despite his fears about being turned away again. "I am your humble servant, so I willingly obey," he told Mary. Bishop Zumaraga was surprised to see Juan again so soon. This time he listened more carefully to Juan’s story and asked questions. But the bishop was suspicious that Juan had really seen a miraculous apparition of Mary. He asked Juan to ask Mary to give him a miraculous sign that would confirm her identity, so he would know for certain that it was really Mary who was asking him to build a new church. Then Bishop Zumaraga discreetly asked two servants to follow Juan while he walked home and report back to him about what they observed. The servants followed Juan all the way to Tepeyac Hill. Then, the servants reported, Juan disappeared, and they couldn’t find him even after searching the area. Meanwhile, Juan was meeting with Mary a third time on top of the hill. Mary listened to what Juan told her about his second meeting with the bishop. Then she told Juan to come back at dawn the next day to meet with her once more on the hill. Mary said: "I will give you a sign for the bishop so that he will believe you, and he won’t doubt this again or suspect anything about you again. Please know that I will reward you for all of your hard work for me. Go home now to get some rest, and go in peace." But Juan ended up missing his appointment with Mary the next day (a Monday) because, after returning home, he discovered that his elderly uncle, Juan Bernardino, was gravely ill with a fever and needed his nephew to take care of him. On Tuesday, Juan's uncle seemed about to die, and he asked Juan to go find a priest to administer the sacrament of Last Rites to him before he passed away. Juan left to do so, and on the way, he encountered Mary waiting for him -- despite the fact that Juan had avoided going to Tepeyac Hill because he was embarrassed about having failed to keep his Monday appointment with her. Juan wanted to try to get through the crisis with his uncle before having to walk into the city to meet with Bishop Zumaraga again. He explained it all to Mary and asked her for forgiveness and understanding. Mary replied that Juan didn't need to worry about accomplishing the mission she gave him; she promised to heal his uncle. Then she told him that she was going to give him the sign the bishop had requested. "Go to the top of the hill and cut the flowers that are growing there," Mary instructed Juan. "Then bring them to me." Even though frost covered the top of Tepeyac Hill in December and no flowers naturally grew there during the winter, Juan climbed the hill since Mary had asked him to, and was surprised to discover a group of fresh roses growing there. He cut them all and took of his tilma (poncho) to gather them together inside the poncho. Then Juan ran back to Mary. Mary took the roses and carefully arranged each one inside Juan's poncho as if designing a pattern. Then, after Juan put the poncho back on, Mary tied the poncho's corners behind Juan's neck so none of the roses would fall out. Then Mary sent Juan back to Bishop Zumaraga, with instructions to go straight there and not to show anyone the roses until the bishop saw them. She reassured Juan that she would heal his dying uncle in the meantime. When Juan and Bishop Zumaraga met again, Juan told the story of his latest encounter with Mary and said that she had sent him some roses as a sign that it was truly her talking with Juan. Bishop Zumaraga had privately prayed to Mary for a sign of roses -- fresh Castilian roses, like the kind that grew in his home country of Spain -- but Juan wasn't aware of that. Juan then untied his poncho, and the roses tumbled out. Bishop Zumaraga was astonished to see that they were fresh Castilian roses. Then he and everyone else present noticed an image of Mary imprinted on the fibers of Juan's poncho. The detailed image showed Mary with specific symbolism that conveyed a spiritual message that the illiterate native people of Mexico could easily understand, so they could simply look at the image's symbols and comprehend the spiritual significance of Mary's identity and the mission of her son, Jesus Christ, in the world. Bishop Zumaraga displayed the image in the local cathedral until a church could be built in the Tepeyac Hill area, and then the image was moved there. Within seven years of the image first appearing on the poncho, about 8 million Mexicans who previously had pagan beliefs became Christians. After Juan returned home, his uncle had completely recovered and told Juan that Mary had come to visit him, appearing within a globe of golden light in his bedroom to heal him. Juan served as the official custodian of the poncho for the remaining 17 years of his life. He lived in a small room attached to the church that housed the poncho, and met with visitors there every day to tell the story of his encounters with Mary. 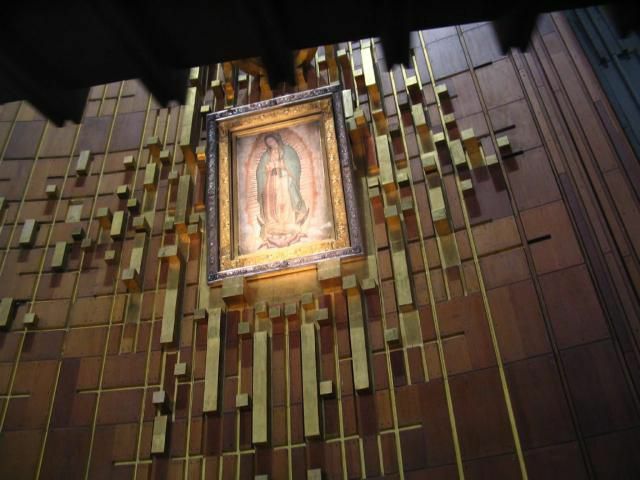 The image of Mary on Juan Diego's poncho remains on display today; it's now housed inside the Basilica of Our Lady of Guadalupe in Mexico City, which is near the site of the apparition at Tepeyac Hill. Several million spiritual pilgrims visit to pray by the image every year. Although a poncho made of cactus fibers (as Juan Diego's was) would naturally disintegrate within about 20 years, Juan's poncho shows no signs of decay nearly 500 years after Mary's image first appeared on it.